Oil on gessoed board 20″x 16″ Framed and hand finished by the artist. Roses in a still life setting painted in the artists studio 2016. Various studio objects are included in the setting painted in a broad manner with upright brush strokes and delicate pink and white roses. The flowers are in full bloom and just about to drop their petals, some have already fallen. 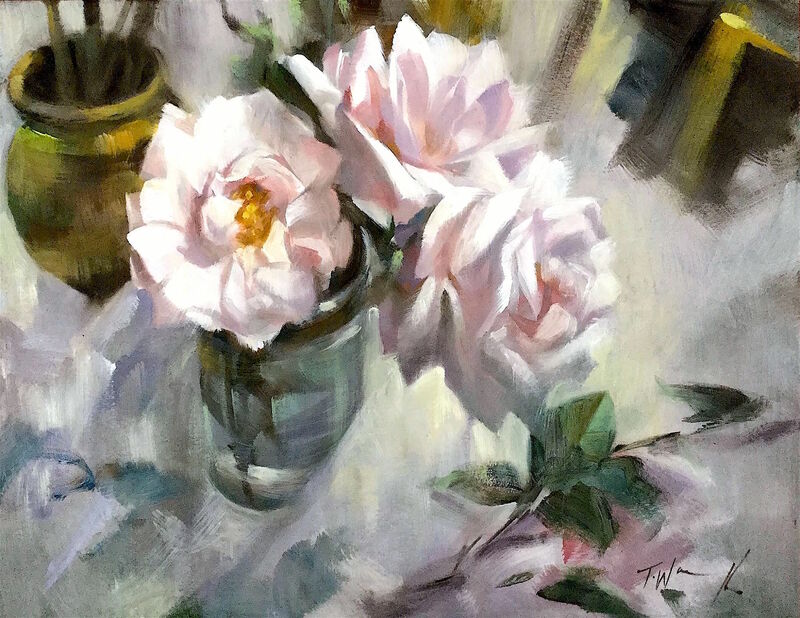 The familiar gilded pot of brushes Trevor has used in other paintings can be seen in the background and slightly out of focus along with some other dark objects, throw the roses into relief. An unusual “S” shaped composition of objects makes up the horizontal format.